Our automated shrink wrapping service allows for your printed materials to be covered with plastic. This is an alternative to hand wrapping and bagging. Your materials are covered in a transparent film, thereby showcasing your products. This plastic film serves several other purposes, including protecting your materials from damage and making counting, inventorying and distribution of your materials easier. With our automated shrink wrapping service, there is no need to pause for sealing, which means the turnaround time is shortened. Documents of all types and sizes can be shrink wrapped as part of the finishing process for your order. No job is too big or too small for Steve’s Bindery Service, Inc.
Our automated shrink wrapping equipment is the Arpac L-18. This machine provides us with fast, user-friendly and reliable operations for high quality shrink wrapping. 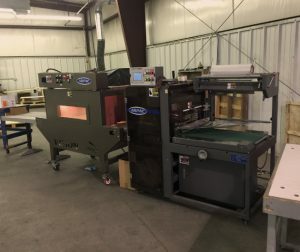 Some of the machine’s features include a unique trim takeaway, which eliminates file tail breaks, a worry-free rewind system that reduces the amount of shrink wrap film needed and an easy load cradle for film. It accommodates 24” CF width film. An innovative pinch roller design pulls the “raw” film ahead of the seal bar. Even the lightest film will not break, which allows for precise control of the film web. This reduces the film width requirement when wrapping most products. The L-18 has a maximum packaging speed of 40 pieces per minute, although our machines are not operated at maximum capacity. We have found that operating our equipment at slower speeds produces a higher quality product with less downtime because of machine malfunction. At Steve’s Bindery Service, Inc., our equipment is meticulously maintained, thereby ensuring less downtime and that our customers receive the highest possible quality in their finished product.